Carmelo Anthony’s future with the New York Knicks is uncertain following another underwhelming season from the franchise. Jeff Hornacek’s men are on course to miss the playoffs for the fourth season on the bounce, with limited progress made from their 32-win campaign of last term. The Knicks made moves in the last off-season to secure the signings of former NBA MVP Derrick Rose and Joakim Noah to boost their struggling roster. However, even with their presence and development of Kristaps Porzingis, along with Anthony, the club have still failed to fire on the court, leaving them well off the pace in the Atlantic Division of the Boston Celtics and the Toronto Raptors. As a result, New York are facing a battle to surpass their paltry win total from last season, although the latest betting odds are backing them to finish in a similar range due to the fact Hornacek’s men have experienced a torrid run of form since the turn of the year. The Knicks are almost certainly out of the playoff hunt and another off-season of rebuilding awaits Phil Jackson in an attempt to get the club back in the hunt for the NBA Championship. One of the first decisions that must be made is the future of ten-time NBA All-Star Anthony, who has seen his playing time reduced towards the end of the term. The 32-year-old was linked with trade moves away from Madison Square Garden earlier in the season, but remained despite the speculation. His performances have been solid, but far from the peak form he displayed during his tenure with the Denver Nuggets and his early career in New York. Anthony has still averaged a team-high 22.8 points per game, but has not thrived alongside Porzingis and Rose in the ‘full triangle’ system employed by Hornacek this season, drawing the ire of his coach. All signs appear to suggest that the 32-year-old and Rose will not be on the roster at the start of the next term, the former MVP’s contract due to expire at the end of the season. That would leave Porzingis alone in the triangle, although at the same time it would allow Hornacek to bring an influx of youth into the side, using the potential of the loaded upcoming NBA Draft to retool their roster. Outside of Porzingis, Willy Hernangomez has offered an outlet for the club this season and with further playing time under his belt before the end of the campaign, the 22-year-old could become a vital part of Hornacek’s side for the future. Veteran players Courtney Lee and Justin Holiday should be able to provide a semblance of leadership on the court to aid the rebuild, having both proved to be fairly reliable over the course of the season in a solid move made by Jackson. Anthony has been a fixture of the Knicks’ line-up for almost six years, but his departure along with that of Rose could bring about the transformation that the club has been begging for to spark them back into life. 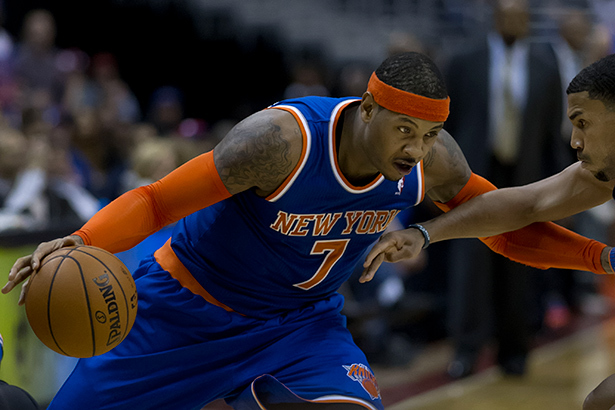 ← Previous Story Who Should the Knicks Target Before the Trade Deadline?